Experience an absolutely natural rowing feeling with a smooth, flowing stroke: The unique water resistance system with Fluid-Technic provides a continual resistance in each stroke. You deceide how intense you train: the harder the stroke, the higher the training resistance. Clever extra: Change the base resistance to four different levels over the red regulator, without having to change the amount of water in the tank. The variable water resistance system makes the Row HX Trainer the perfect training partner for users of every fitness level. Easy to move and a small footprint – you can find a place for the Row HX Trainer anywhere. In a quick lift the rowing machine can be stood up to a smaller size and thanks to the transport wheels is easily moved around. Therefore you can store the rower space-savingly away until the next workout. The combination of high quality ashwood and hardened steel gives the perfect balance between elegance and durability. The Row HX Trainer fits into every room abience with its stylish design – not only a gain for your health but also for your home. The heart of the Life Fitness Row HX Trainer is its natural water resistance system. Experience a comfortable and joint-friendly course of movement, that closely simluates real-life rowing. The consequential strokes flow into each other and the rowing machine is very quiet. You deceide how intense you train: the harder the stroke, the higher the training resistance. Therefore you can change the resistance at any time during your training. The Row HX Trainer is built with clever function: You can change the base resistance to four different levels over the red regulator, without having to change the amount of water in the tank. That makes the Row HX Trainer the perfect rowing machine for users of all fitness levels – as a beginner just wanting to start rowing training or for advanced users wanting high intense workouts to continually challenge themselves. Due to the natural properties of wood a light difference in colour is possible. 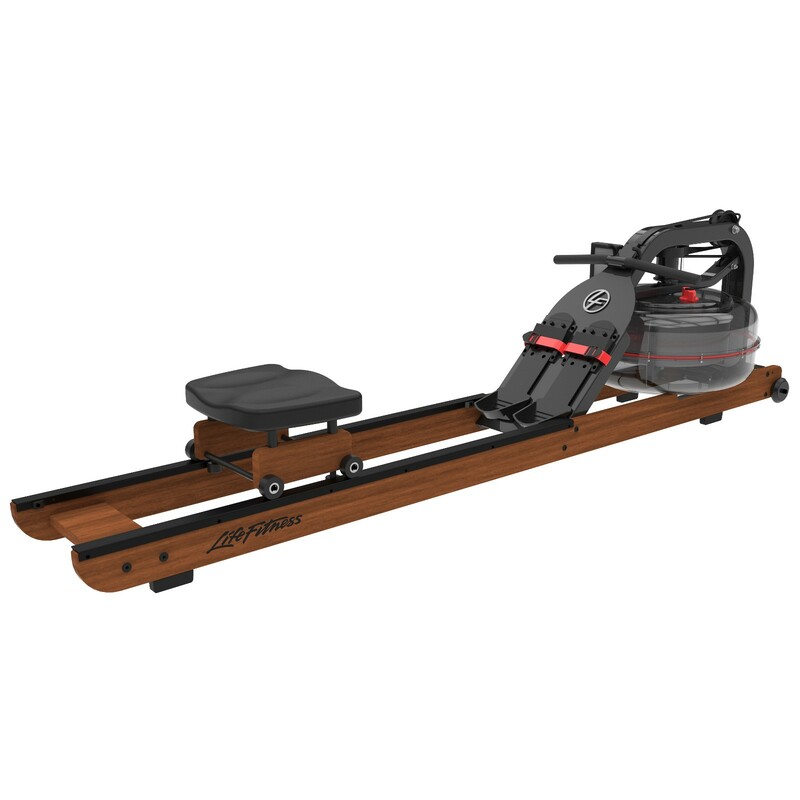 The Life Fitness Row HX Trainer in dark ashwood combines appealing design with high functionality and durability. Manufactured in the high quality standards known of the brand Life Fitness, for all users who value asthetics and effective training. The combination of wood and hardened steel gives the rower exceptional stability. The Row HX Trainer is a home fitness machine for the whole family and offers an extensive total body training with in the comfort of your own home. Rowing machines belong to the most effective total body training methods. The Row HX Trainer from Life Fitness combines strength and cardio training into one fitness machine – perfect for a joint-friendly and versatile total body training at home. Training from a light session to strengthen the cardiovascular system to a full power HIIT session is possible. Over 80% of the body's muscles are used while rowing. Bring more movement into everyday life with the Row HX Trainer and improve your fitness and health! The Row HX Trainer is optimised for training at home. The training computer is intuitive to use, the display is easy to read and shows your important training data. An optionally available Life Fitness heart rate receiver for rowing machines lets you measure your heart rate over a chest strap so you stay in the optimal heart rate range for your training goal. The heavy frame made of wood and steel and the large base of the Life Fitness rowing machine gives it high stability. Therefore the HX Rower easily stands its ground even in intensive training sessions. The comfortable seat and the adjustable footrest result in a proper rowing position. After your training you can space-savingly store away the rowing machine upright thanks to the transport wheels and folding mechanic. Heart rate receiver for Life Fitness rowing machines In stock!